The international GLOBAL HUMANITARIANISM | RESEARCH ACADEMY (GHRA) offers research training to PhD candidates and early postdocs. It combines academic sessions at the Leibniz Institute of European History in Mainz and the Imperial and Global History Centre at the University of Exeter with archival sessions at the Archives of the International Committee of the Red Cross in Geneva. The Research Academy addresses early career researchers who are working in the related fields of humanitarianism, international humanitarian law, peace and conflict studies as well as human rights covering the period from the 18th to the 20th century. It supports scholarship on the ideas and practices of humanitarianism in the context of international, imperial and global history thus advancing our understanding of global governance in humanitarian crises of the present. In July 2017, the GLOBAL HUMANITARIANISM | RESEARCH ACADEMY will first meet for one week in Mainz for academic sessions of lectures, class meetings and discussions, including study time (In the previous year this meeting took place in Exeter). PhD students will have the chance to sharpen the methodological and theoretical focus of their thesis through an intense exchange with peers, postdocs, and established scholars working in the same or related field of humanitarianism. The postdocs will benefit from discussing their research design and publication strategy with established scholars. The academic session at Mainz and Exeter is each year followed by a one week archival session at Geneva. Here the archives of the ICRC offer a unique insight into humanitarian action during the past 150 years. The holdings provide rich material, including visual material, for the history of international affairs in the ages of nation states, empires and global governance, particularly the study of humanitarianism, humanitarian law, conflicts studies as well as related issues such as human rights. Under the guidance of the experienced staff from the archive, the members of the Research Academy will study primary sources related to the previous discussions at Mainz as well as to their own research projects if applicable. Opportunities will also be provided for intensive discussions with active members of the ICRC staff and other Geneva based humanitarian organisations. Each selected academy fellow receives the cost of travel to Mainz and accommodation in Mainz and Geneva. Academy fellows will be asked to purchase their travel to Geneva as proof of their commitment to attending the Academy. This application should be compiled by the applicant and the whole set of papers including statements of support should be submitted as a PDF, with the file saved as ‘LASTNAME_FIRSTNAME.PDF’. 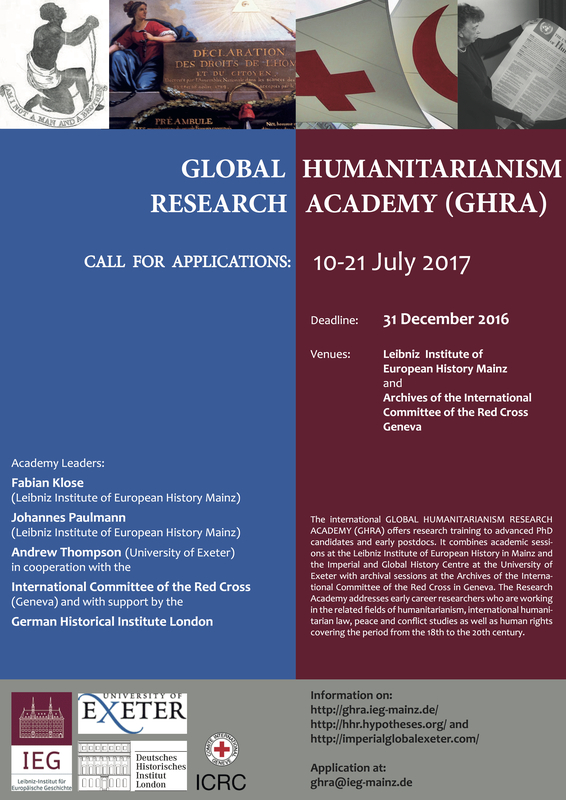 To apply, please send your application consisting of one pdf-document with the Subject “GLOBAL HUMANITARIANISM | RESEARCH ACADEMY” to the organisers at ghra@ieg-mainz.de by December 31, 2016.